30 Abraham Lincoln Games Download. Games and Activities in PDF files. One of our premium printable curriculum package downloads in PDF files stored in Zip files. 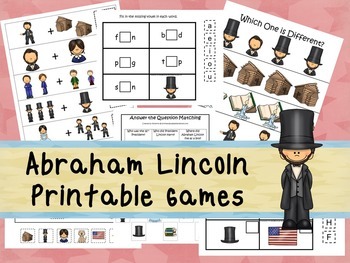 30 Abraham Lincoln printable educational learning games and activities in PDF files stored in zip files. You can access the PDF files with any PDF file reader program including the popular Adobe Reader and zip files with any Zip file reader program. You are purchasing over 30 printable pages of the Abraham Lincoln themed preschool curriculum games and activities in PDF files stored in Zip files in a download. 1 Three Part matching prints 2 pages. 1 Beginning Sounds Clip it Cards prints 3 pages. 1 Match the Number prints 1 page. 2 Number Puzzles 1-10 and 11-20 prints 2 pages. 1 Memory Matching prints 2 pages. 1 Size Sorting prints 2 pages. 1 What Comes Next prints 1 page. 1 Numbers Count and Clip Cards prints 3 pages. 1 Match the Beginning Sound prints 1 page. 4 Pattern Cards prints 5 pages. 1 Answer the Question prints 1 page. 1 Fill in the Missing Pattern prints 1 page. 4 CVC (Consonant, Vowel, Consonant) prints 4 pages. 1 Picture Sudoku prints 1 page. 4 Size Sequence prints 4 pages. 1 Alphabet Sequence Puzzle A-Z prints 1 page. 1 Which One is Different prints 1 page. 1 Math Addition prints 1 page. 1 Positional Cards prints 3 pages. 1 A-Z Tracing Worksheets prints 13 pages. These products were designed by Annette Sutherland, owner of Books and Bubbles Family Care and Teach At Daycare Handcrafted Curriculum, in Arkansas City KS. This printable product is for personal or classroom use only. You may NOT reproduce this product for resell. All sales are final. No refunds are offered because of the nature of the product itself. This is a digital download. Once you make your payment you will be able to download and print your purchase. If you have problems with your download please email me and I will send you another download in place of the file that you had problems with. We use these types of educational games in our learning center with children ages 2-6. Use a combination of our many educational games to teach young children in a daycare or home school setting. Please see the other items in our store. If you have any question please do not hesitate to send me an email.